We’re less than three months from an election which, as you might have noticed, offers stark choices about the future of our country. And now that the Republican ticket is fleshed out (if you can call it that), I do have a favor to ask. 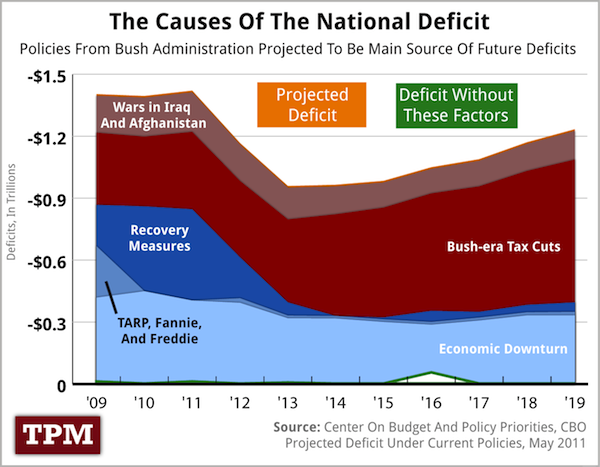 If someone voted for every single damned budget-busting thing during the Bush Administration, you really can’t call him a deficit hawk, or anything resembling fiscally responsible. and yes, I’m referring to Paul Ryan. Let’s go down the list, shall we? Not to worry – Ryan, apparently, is disgusted with his party’s fiscal stewardship during the aughts. Or is he? Ryan has, retroactively, depicted himself as a dissenter from the fiscal profligacy of the Bush administration, and reporters have mostly accepted his account at face value. (“Ryan watched his party’s leadership inflate the deficit by cutting tax rates like Kemp conservatives while spending like Kardashians,” wrote Time last year.) In reality, Ryan was a staunch ally in Bush’s profligacy, dissenting only to urge Bush to jack up the deficit even more. “We noticed that the green-eyeshade, austerity wing of the party was afraid of class warfare,” Ryan said during Bush’s first term. “They fear increases in the debt, and they were overlooking issues of growth, opportunity, and free markets.” For those uninitiated in the tribal lingo of Beltway conservatives, this may sound like gibberish. But those inside the conservative subculture invest these buzzwords with deep meaning. “Green eyeshade” is a term of abuse appropriated by the supply-siders to describe Republicans who still cared more about deficit control than cutting taxes. “Growth” and “opportunity” mean tax cuts that disproportionately benefit the rich, and “class warfare” means any criticism thereof. Ryan’s centrist admirers hear his frequent confessions that both parties have failed as an ideological concession. What he means is that Republicans were insufficiently fanatical in their devotion to cutting taxes for the rich. Paul Ryan is a fraud. A radical, dangerous, fraud. And here’s one way you know: the “deficit reduction plan” he offered starts out by…increasing the deficit. I realize you guys can’t really call Paul Ryan a fraud, right there on page one, or at the top of your nightly newscasts. But you might note that in his fourteen year career, it wasn’t until after January 20, 2009 at 12:01 PM EST that Ryan started articulating any concern at all with our national debt. (To be fair, lots of Republicans fought off their deficit concerns until that moment, when, exhausted with that fearsome battle, they gave in to the long and deeply held principles they had painfully subdued during the Bush years.) And perhaps Ryan is sincere now, and merely incompetent at putting together deficit reduction plans that actually, you know, reduce deficits. I think the simplest explanation is usually best, which is, in this case, that Paul Ryan doesn’t give a flying fig about deficits, but is using them to push through a radical change in how this country deals with tax and entitlement policy, and cares not a whit if it makes the deficit worse.